Noble, Indeed | Rosi G.
Oh that is gorgeous! Especially the pin, thanks for the link! As for me..ok, don’t have a lot planned anyways. Phew! Is that the same yarn you were making the commissioned piece from? Gorgeous! Very pretty! Nice yarn too. Umm. Did I miss something? What happened to your blog??? I’m not saying that I don’t like it but it just caught me off guard. I had to make sure I read the title right. 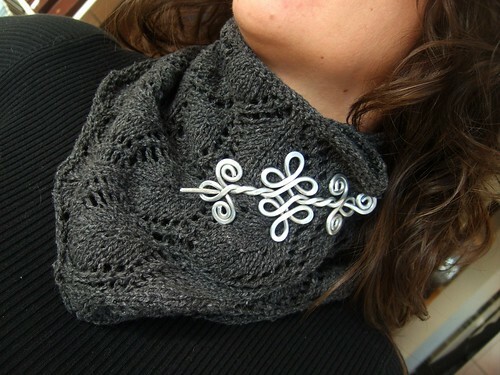 Nice cowl and I love the shawl pin. Both compliment each other so well! 🙂 Beautiful work as always. That is so cute! Adorable cowl! I also love the new layout on your blog. Don’t mention my holiday knitting. Let’s talk about your holiday knitting instead, because you are done with this lovely cowl! It’s very elegant, I’m sure it’ll be oohed and aaahed over as it deserves.